Turbolaser bolts glow visibly even in vacuum. Since lasers don't radiate energy away from their direction of travel, the bolts can't be lasers. Turbolaser cannons have physical holes at the ends of their barrels. Since a laser should have a lens at its end, this indicates that some physical object is exiting the barrel. Damage effects occasionally precede the impact of the visible portion of the bolt, which means that the bolts have an invisible portion. The visible portion may represent a second stage of the weapon, or it may represent a form of "tracer". The visible portion of a turbolaser bolt travels at distinctly subluminal speed even in vacuum. Since light travels at c in vacuum, the bolts can't be lasers. The invisible portion of the bolt outraces the visible portion by a miniscule margin if at all, so it also cannot be a laser. Turbolaser bolts do not appear to be affected by gravity, as demonstrated when multiple shots were fired in low orbit over Tatooine (so low that Luke Skywalker was able to see the battle through his binoculars). Given the relatively low propagation velocity, we should have been able to detect gravitational effects. The same is true of ground and airspeeder blasters. Some of the visible portion of a turbolaser bolt can be affected by gravity, as demonstrated by the green discharge falling toward the Death Star in the picture above. This indicates that the characteristics of the luminous green material vary depending on its proximity to the bolt; if it's in the bolt, then it is unaffected by gravity, but if it is too far from the bolt, then it behaves like normal gas. Turbolaser bolts are capable of detonating with a "flak effect" at a predetermined range, as demonstrated by ISD fire in TESB (against the Falcon) and AT-AT anti-aircraft fire. Turbolaser bolts have a distinct shape and contour, with internal variations in luminosity. Each bolt contains a bright "pulse" in its head that is similar to the pulses that were seen moving down the Death Star superlaser tributary beams, as well as the main beam. Turbolaser propagation speed is not fixed. Heavy turbolaser blasts in ROTJ travelled much more quickly than light turbolaser shots in ANH and TESB, and the Death Star superlaser propagated at an even higher rate. Turbolaser colour does not change with time and distance, ie- the bolt does not fade or change its colour spectrum as it moves through space. Turbolaser bolts can have significant momentum, as demonstrated by a turbolaser impact on the Millenium Falcon's aft quarter in TESB as well as the cannon recoil observed whenever we see close-ups of the guns in operation. There is very little variation in turbolaser colour. The colour of a TIE fighter blast is not noticeably different than the colour of the Death Star superlaser. If variation does occur, it does not occur in a continuous fashion, ie- there is no smooth spectrum. All bolts appear to be either red or green, with no points in between. This suggests that the colour of the bolt has nothing to do with its power level and may in fact be an arbitrary, deliberate choice, which would be in keeping with the "tracer" idea. The bolts are composed of massless particles which move at subluminal speed, even though no such particle has ever been observed or even theorized to exist. Some of these particles would presumably radiate light in the visible spectrum while others would radiate light well out of the visible spectrum. The visible gas is most likely a simple "tracer", and it is generated through an entirely separate mechanism in the cannon, so a damaged or poorly maintained cannon might fail to properly synchronize the visible and invisible portions of the bolt, hence causing the rare "preceding damage" effect. However, this wouldn't explain the fact that excess visible gas is affected by gravity when it leaks from the gun barrels (see the picture at the top of this page). There is a peculiar characteristic of the bolt which counteracts gravity in its immediate area. This would presumably be some sort of moving field effect, albeit one of unknown mechanism. It is hard to even imagine what could possibly cause this, so it seems rather unlikely. There is a physical projectile in the centre of each bolt which incorporates gravity cancellation technology, and which damages the target through some sort of invisible field effect (ZPF?) which extends ahead of the projectile itself. It would presumably be "charged" by the cannon as part of the firing process, hence the high power requirements, it would leak luminous waste gas in flight (either by chance or by design), and its waste gases would lose their luminosity as they fall away from the projectile, hence the drop-off in luminosity as you move away from the core of the bolt. An occasional projectile might be "out of spec" or over-charged by the cannon, resulting in an unusually large damage field and the rare "preceding damage" effect. Of course, the most obvious criticism of this theory is that we have never observed even the slightest hint of such a projectile, and it introduces extra mechanisms, extra entities, and extra questions, so Occam's Razor looks rather unfavourably upon the idea. The bolts are composed of light-speed particles which move in a very tight helix, so their forward propagation rate is distinctly subluminal. The first theory seems like the best one (one could even rationalize the apparent sublight velocity if necessary, by suggesting that light-speed massless particles are moving in a helical coil around the turbolaser's axis of movement due to some exotic effect, thus maintaining c while appearing to move slower than light; a tight coil would shorten the range before the helical effect fails and you get a "flak burst", while a straight beam would move at c and never flak-burst). There doesn't seem to be enough evidence to rule out any of these theories (although the third one is rather tenuous). However, at this point, it is clearly easier to say what turbolasers are not, as opposed to saying what they are. They are not lasers. They are not particle beams. They are not plasmoids. According to the official literature, turbolasers and blasters use tibanna gas as part of their operating mechanism. The exact characteristics of tibanna gas are classified, but we can tell you that it was harvested from stellar chromospheres and nebular clusters (ref. Rebel Dawn) until a more convenient source of tibanna gas (and other precious minerals including corusca gems) was located in the tumultuous 6000K lower atmosphere of Bespin (ref. Star Wars Illustrated Universe). A Star Destroyer used its light trench-mounted guns to vaporize 40 metre wide asteroids in TESB with 1/15-second bursts (see Brian Young's Turbolaser Power page for more information), resulting in a lower limit of 22,500 TW for light turbolaser output. Note that this only applies to light turbolasers. If the ratio of light to heavy turbolaser output is proportional to the size difference, then heavy turbolasers must therefore output roughly 2.8 million TW. Some Federation cultists claim that the asteroids in TESB were actually disintegrated rather than vaporized, but they apparently did not notice that the "debris" (small coalesced blobs of superheated liquid that were metastable and in the process of vaporization) evaporated into invisible gas within a fraction of a second, while solid visibly glowing debris would have continued to be visible for at least 10 seconds as it cooled. A Star Destroyer hit the Millenium Falcon with a blast that knocked it off its axis in such a manner that if the originating weapon were a laser, the lower limit for its power level would be over 215,000 TW. This figure is based on the possibility that turbolasers fire massless particles. If turbolasers do not fire massless particles, then this figure is not applicable. Also, it ignores the effect of the Millenium Falcon's stabilizer systems so it is a low estimate. According to the Star Wars Technical Journal, a Base-Delta-Zero operation is the act of melting the surface of a planet. The operation was performed on Caamas just after the Clone Wars (ref: Spectre of the Past), and it was so devastatingly ruinous that the planet was still totally uninhabitable forty years later. In fact, resettlement efforts of Caamasi survivors (presumably those who had been off-world at the time of the attack) were centred around the discovery of a new Caamasi homeworld, which would then be terraformed to Caamas' specifications. This indicates that it would have actually been easier to terraform a barren, uninhabited world than to make Caamas inhabitable again! It is possible to generate a very conservative estimate by assuming a dry planet (no oceans) and assuming that this devastation will be caused by the melting of surface material to a depth of one metre. Therefore, if we use Earth as an example of a typical target planet, the Base Delta Zero operation must melt 5.1E14 m³ of surface material. The crust of a typical planet is composed mostly of silicates, so the thermodynamic properties of silicon dioxide can be used as a reasonable basis for estimating the characteristics of planetary crust material. The melting point of silicon dioxide (quartz microstructure) is 1883K, its density is 2220 kg/m^3, and its specific heat is roughly 1050 J/kgK at high temperatures (ref. Fundamentals of Heat and Mass Transfer 3rd Edition by Incropera and Dewitt). The energy required to heat 5.1E14 m³ of rock from 300K to melting point is therefore 1.9E24 J. The latent heat of fusion for SiO2 is at least 250 kJ/kg (ref. CRC Handbook of Chemistry and Physics 50th Edition), which adds 3E23 J to the energy estimate. This leads to a grand total of 2.2E24 J. This operation must not take longer than 1 hour or so, otherwise significant numbers of planetary citizens would be able to evacuate. The power requirement is therefore at least 600 million TW. There are 12 heavy turbolasers and roughly 120 light turbolasers on an ISD1 (ref. SWICS). The heavy turbolasers are roughly 125 times bigger than the light turbolasers (which were seen vaporizing asteroids in TESB). If firepower is proportional to size (an unsubstantiated but not unreasonable postulate) then the sustainable power outputs of the heavy and light guns work out to 47 million TW and 375,000 TW respectively. Refire rates seem to be roughly 1 shot per 2 seconds, so the energy level of each individual blast would have to be 94 million TJ (22 gigatons of TNT) for heavy turbolasers and 750,000 TJ ( 179 megatons) for light turbolasers. It should not come as a surprise that Base Delta Zero figures come under almost constant attack by overzealous Federation cultists. If you are curious to study the subject further, visit the dedicated Base Delta Zero page. The EGWT states that a KDY planetary turbolaser cannon is capable of dueling with a Star Destroyer on equal terms. It also states that it releases enough energy to power a large city for an entire day. It is reasonable to imagine that the heavy turbolasers of a Star Destroyer, also capable of damaging and destroying a Star Destroyer with a few shots, are probably of similar yield. 20 billion-person cities are not at all unusual in the SW galaxy. Since the average power consumption of the United States between 1970 to 1985 was roughly 7.5E19 J per year, a large industrialized SW city should easily consume 40 times that much, even if its per-capita energy consumption is no larger than that of a primitive 20th nation. If we divide this by 365, we can easily find that such a city should consume more than 8.2E18 J (1.95 gigatons). This agrees in a general sense with the firepower figures derived from Base-Delta-Zero analyses. Note that this figure is based on the assumption that SW per-capita energy consumption is no higher than that of 20th century industrialized nations, which is an extremely conservative assumption. The massive underground power generation complex underneath the Naboo capital city of Theed is a reminder of how much power a typical SW city probably consumes, particularly since Theed was very sparsely populated compared to more heavily industrialized cities. The Star Destroyer Forger suppressed a rebellion on Gra Ploven by creating steam clouds that killed 200,000 Ploven citizens in three coastal cities (ref. SWE). Since water vapor is normally much less dense than air, it tends to rise rapidly in the atmosphere. Therefore, the only way to affect coastal cities with an oceanic vaporization event is to heat the water to the point where it not only boils but it gains enough pressure to create a hemispherical "mushroom cloud" formation. In order to kill hundreds of thousands of citizens in sparsely populated cities like the Ploven cities, the mushroom cloud would have to stretch at least 5km inland at its deepest point, so that it covers approximately 40 square kilometres. This is fairly conservative; such a cloud would quickly rise away and citizens protected in shelters or even well-built homes would survive. Only exposed citizens would be killed. If the mushroom cloud is to spread horizontally, it must be denser than air. The density of room-temperature air is roughly 1.16 kg/m³ (ref. Fundamentals of Heat and Mass Transfer 3rd Edition), so the steam must be pressurized and heated to at least 0.2Mpa and 150 degrees Celsius. The enthalpy of steam at that temperature and pressure is 2.8 MJ/kg, while the enthalpy of surface water is 0.4 MJ/kg (ref. Engineering Themodynamics by Reynolds and Perkins). Therefore, 2.4 MJ/kg is required to raise the water from one state to the other. The mass of water in a 5km radius hemispherical steam cloud at atmospheric density is 3.04E11 kg, therefore at least 730,000 TJ would be required to generate the steam cloud. However, not one but three coastal cities' inhabitants were boiled alive. Since 730,000 TJ are required to pacify just one city, 2.2 million TJ are required to pacify all three cities. Unfortunately, we don't know how many shots were required to accomplish this feat. We can determine that the cloud must have been created with a "one-shot" massive energy input to create the necessary effect; any sustained low-power process would create the steam but not at the necessary pressure (the pressure is a side-effect of the great speed at which the cloud is formed). If a single blast was fired at each city, this would lead to energy estimates of 730,000 TJ (174 megatons) for the heavy cannons (in spite of the impedance induced by firing through a planetary atmosphere). If a 60-shot broadside was fired at each city, this would lead to energy estimates of 12,200 TJ (3 megatons) for the light cannons. The act of vaporizing such large quantities of water at such speeds is a high-energy event that requires energy levels in the range of hundreds of megatons at the very least. This is somewhat lower than the BDZ firepower estimates, but it is likely that the Forger's weapons were not set to full power- this was an urban pacification exercise rather than an act of wanton destruction. This actually represents a fascinating method of urban pacification; simply destroying the cities with direct bombardment would also eliminate the economic value of the buildings, industries, etc. But a superheated steam cloud can eliminate rebels without destroying the buildings. The only problem with this method is the high energy expenditure; mere nuclear weapons cannot perform such a feat (witness the relatively insignificant steam clouds created by 20th century underwater nuclear testing), and they create high radiation levels. Therefore, only turbolasers can accomplish the task cleanly and efficiently. On pg. 248 of Slave Ship, the following narrative description is provided of the recoil absorption mechanism on a typical turbolaser cannon: "the laser cannons being mounted into the open skeletal frames required bracing and recoil-dissipation casings that would have withstood explosions measured in the giga-tonnage range. Anything less, and a single shot fired in battle would rip a destroyer or battle cruiser in two, a victim of its own lethal strength". This text actually describes laser cannons rather than turbolasers, but the colloquial usage of the terms "laser cannon" and "turbolaser cannon" are so intermingled that we cannot be sure that this does in fact refer to a laser rather than a turbolaser. Since turbolasers are more powerful than lasers, the conservative route is to assume that it refers to turbolasers. The above text indicates that the recoil alone from a turbolaser cannon is equivalent to the effect of a multi-gigaton direct hit, and that it would tear a Star Destroyer to pieces without massive and complex energy dissipation bracings and energy fields. Therefore, this text supports the energy quantifications derived from BDZ and EGWT analyses. It adds yet another piece of supporting evidence that heavy turbolasers output energy in the gigaton range, if not much more. It is absurdto claim that Dodonna would fail to mention the superlaser when it is the entire reason for attacking the station in the first place. He discussed the superlaser at no other point in the briefing, and he would have had to mention it at some point. The defense turbolasers couldn't hit the starfighters either, since they were designed to hit capships, not fighters. They were no more of a threat to the fighters than a heavy 20th century anti-ship missile launcher would be a threat to an aircraft. Therefore, they were of little or no relevance to the mission briefing. The SWEGWT states clearly that "the resulting energy beam had more firepower than half the Imperial starfleet and could instantly reduce a world to asteroid fragments and space dust." This clearly proves that Dodonna was talking about the superlaser. At this point, the problem with our estimates is that we don't know whether Dodonna was talking about the firepower of a single blast or volley, or the time-averaged firepower. However, the SWEGWT indicates that Dodonna was discussing the firepower of a single blast rather than the time-averaged firepower, so this means that "half the star fleet" must be capable of unleashing 1E38 joules with a single volley of its combined weaponry. If we wish to be conservative, we may wish to assume, in spite of this evidence, that Dodonna was actually talking about time-averaged firepower (~1E33 watts). Unfortunately, we still don't know what he meant by "half the star fleet." He might have meant the most visible portion of the star fleet: the 25,000 ISD's that performed standard sector-control and patrol duties in the far-flung regions of Emperor Palpatine's Empire. It is also possible that he was describing all of the capital vessels in the fleet, including the millions of light cruisers, command vessels, shuttles, freighters, and assorted support vessels that maintain the Empire's infrastructure. If Dodonna was describing the ISD fleet, then the implication of his statement would be that a single ISD carries ~4E28 watts of total firepower. If he was describing the entire star fleet, with millions of ships (perhaps as many as 10 million), then the average ship carries ~1E26 watts of total firepower. This reference is quite nebulous, and open to interpretation from various angles. The numbers are very high, even if we assume that there are well over 10 million capital vessels in the Imperial star fleet. Therefore, it is most likely that other, smaller superlasers and heavy strategic weapons were included in this analysis. Superlasers were not new to the Empire at the time of ANH; the DS was simply "the most powerful superlaser ever constructed." according to Mon Mothma (ref. Soldier for the Empire). These figures are therefore difficult to use as true analyses of turbolaser firepower. However, they are evidence that the Imperial star fleet in its entirety must possess twice the firepower of the Death Star's superlaser. Regardless of how this breaks down, it disproves the ludicrous Federation cultist claims that we do not possess any high-yield weapons apart from the Death Stars. This information also allows us to establish that there is canon evidence to support the figures drawn from official data, and that this canon evidence in fact suggests that the official figures are conservative. "No other weapon produced during the Galactic Civil War proved as devastating as the awesome Imperial superlaser. The superlaser was created by several turbolaser pulses, produced by amplifications crystals around the cannon's circular well. These pulses were fused over the central focus lens, resulting in a devastating energy beam with more firepower than half the Imperial starfleet". This passage contains two critical revelations: first, it indicates that the superlaser is based on turbolaser technology. Second, it confirms the fact that Dodonna was talking about the superlaser, not the defense turrets, when he said that the Death Star carried "a firepower greater than half the starfleet". The second revelation has already been discussed, in the previous section. However, the first revelation is critically important. If the superlaser is in fact a huge compound turbolaser (which is what the BTM text explicitly states), then turbolaser technology and Death Star superlaser technology can be assumed to have similar characteristics and capabilities (albeit adjusted for sheer scale). This clearly demonstrates the validity of the 1E26 to 4E28 watt firepower figures derived from Dodonna's briefing, and it disproves the ludicrous (and long-standing) Federation cultist myth that conventional Imperial turbolaser technology cannot be compared to Death Star superlaser technology. According to BTM, they are the same technology. In conclusion, the combined analyses from BDZ, EGWT, Shield of Lies, Slave Ship, General Dodonna's ANH briefing, and the BTM CD all conspire to indicate that Star Destroyer heavy turbolasers release energy at a rate of at least 1E19 watts (over 2 gigatons of TNT per second). Light turbolaser power levels are much lower, most likely in the range of 1E17 watts (over 20 megatons per second). A broadside from an ISD1 (6 heavy guns and 60 light guns) would therefore be more than 6E19 joules (14,000 megatons). The consistency of these figures is a testament to their validity, indicating that these yields have been displayed and discussed over and over again in the official sources. The above figures are official rather than canon, but they are actually conservative: Dodonna's briefing and the BTM CD both suggest much higher figures. It is also possible to derive absolute lower limits based on TESB, but this is extremely conservative since those blasts were probably low-power shots. Nevertheless, the canon lower limits would be 1500 TJ for light guns and 187,500 TJ for heavy guns. A lower-limit broadside would therefore be roughly 1.2E18 joules (290 megatons). Heavy ground-based ion cannons can be very dangerous to the shipboard operations of capital ships, as the Rebels demonstrated at the Battle of Hoth (which was nevertheless a decisive victory for the Empire). However, they cause only superficial physical damage; their most significant impact is their ability to temporarily disrupt power systems, thus temporarily "decapitating" the ship by disrupting its control systems. The extremely large power reactor systems on planetary surfaces can power very large ion cannons, but capital ships are limited to much smaller ion cannons. The heavy dorsal ion cannon turrets of a Star Destroyer are similar in firepower to ground-based units like the KDY-150 pictured above. However, those ion cannon turrets are located toward the rear of the vessel and have a limited field of fire unless the vessel is in a broadside situation against another heavy ship. The small ion cannon emplacements that dot the rest of a Star Destroyer's surface are much less powerful and cannot instantly penetrate capital-ship shielding and armor like the larger units. However, they can easily disrupt the power systems of small vessels and they act as an excellent weapon when used in conjunction with heavy turbolaser bombardment. It is not currently known what effect ion cannons will have on Federation starships, but we have some positive encouragement from the fact that charged gases easily disrupt Federation shielding even when present only in very diffuse quantities, as seen in ST2 as well as Starship Down, and that an ionic pulse easily penetrated the shields of a BOP in ST:G.
TIE fighters are armed with "laser cannons", although the characteristics of these cannons are anything but laser-like. The nature and properties of laser cannons are both very well known and there is no need to repeat a discussion of those phenomena here unless you recruits have been neglecting your studies. However, we have some preliminary analysis on a possible quantification of those weapons in Federation units. From Luke Skywalker's strafing run in the Battle of Yavin, a single hit upon the unshielded surface of the Death Star could be seen to cause a large flash of superheated material, enough to engulf an entire X-Wing fighter and cause thermal damage to its hull despite its shields. Since armor is not flammable and lasers do not create wide-area flashes directly, one can conclude that large portions of the Death Star's surface buildings are flashing to vapor during Luke's strafing run. Because of the shallow angle of approach and the fact that the flashes vary in size and brightness, it is difficult to gauge the actual amount of destruction being done. However, in order to create a flash of vapour the size of an X-wing fighter, the individual blasts must be vapourizing at least one cubic metre of metal each. This is a very conservative estimate since the gas also had to shoot away from the surface so quickly it intercepted the hurtling starfighter, but it will have to suffice. At least 60GJ is required to vaporize a single cubic metre of ordinary iron, so this provides a lower limit for starfighter laser cannon energy. We must stress the highly conservative nature of this estimate: the DS shell was constructed of heavy armor, and Imperial armor is far superior to simple iron. In The Stele Chronicles, a TIE fighter pilot deliberately flew his unshielded fighter into the atmosphere of a planet at high speed as an evasive maneuver. The unprotected armor and transparent front window of his fighter were totally unaffected by this event- an event that would easily push ordinary iron beyond its maximum service temperatures as the 20th century Space Shuttle's ceramic heat tiles demonstrate. Furthermore, Imperial dura-armor is made by "compressing and binding neutronium, lomite, and zersium molecules together through the process of matrix acceleration", according to the SWE. The use of neutronium micro-particles as interstitial alloying elements in dura-armor is strongly suggestive of extreme mechanical and thermal toughness. pg. 7 "Two New Republic Assault Frigates, the Tyrant's Bane and Liberty Star, cruised in toward the Golan station. Though each ship was less than a third as long as the station, they bristled with fifty laser cannons and poured terajoules of coherent light into the Golan." pg. 111 "Moonshadow was coming up and turning to port, its port-side batteries firing Direption's aft shields. Red and blue laser and ion cannon fire pumped terajoules of energy into the shields, but somehow they stayed up." These quotes suggest that New Republic laser cannons (and ion cannons) unleash energy in the terajoule range (implying 1E12 to 1E15 joules, otherwise it would be into the petajoule range). The second quote is a bit vague, but it describes a pair of Star Destroyers doing battle. It should be noted that both ships were already heavily damaged, and are apparently left with nothing but their laser and ion cannons (since they had destroyed each others' heavy turbolaser turrets earlier in the battle). The novel does not describe the behaviour of turbolasers and heavy turbolasers in detail, except to say that a single heavy turbolaser volley is sufficient to collapse a corvette's shields and damage it so badly that it becomes a floating hulk. This is hardly surprising, given the firepower that heavy turbolasers are known to have. The word "laser" is defined differently in the Star Wars universe. This is not a satisfactory explanation because the language of the Star Wars universe is not English and the films merely show everyone speaking English so that the audience can understand. Therefore, the dialect of English in the films is 20th century American English complete with all of its dialectic subtleties, as well as its technical terms such as "laser". Imperial laser cannons use a tracer mechanism to make them visible. This mechanism acts as a targeting and visualization aid for fighter pilots and defensive gunners, and it consists of an energy discharge which follows the laser and glows visibly. Assuming that it consists of particles which have mass, the tracer will lag behind the laser itself. This would explain the fact that the TESB asteroids actually began melting before the visible tracer arrived. Industrial capability: the fact that both Death Stars were secretly constructed proves that the Empire has superior industrial capacity. Power generation: the superlaser's incredible power requirements prove that the Empire has superior power generation technology. Firepower: the awesome destructive capability of the superlaser proves that the Empire has superior weapons technology. The Death Star establishes a benchmark for Imperial technology and resources, and this benchmark is so high that Federation cultists will quite literally do or say anything to refute it. Their typical response to any Death Star-related discussion is to claim that the Death Star was not as powerful as claimed, or that the Death Star is a freakish anomaly, millenia ahead of all our other technology. Both claims are ludicrous to the point of being idiotic; the Death Star's power is irrefutably established in canon by the destruction of Alderaan, and it is idiotic to believe that the power generation or weapons technology of an ISD would be millenia behind a Death Star constructed by the same civilization. The absolute lower limit for the gravitational binding energy of an Earth-like planet is 2.2E32 joules (click here for the derivation of this figure). There are many different ways to damage a planet, but you can quite literally slice, dice, melt, or vaporize a planet without destroying it. The only way to destroy it is to scatter its mass at incredible speed, so that gravitational forces cannot re-assemble it. Of course, absolute limits are usually much lower than realistic figures, and this is no exception. If Alderaan exploded at mere escape velocity, it would have taken more than ten minutes to double in size. This obviously wasn't the case; the planet exploded very violently. Scaling of the Alderaan destruction scene in ANH leads to the conclusion that the approximate speed of the debris cloud's outermost region (not the meaningless pyrotechnic "ring" seen in the SE's) is roughly 1.8E7 m/s. Therefore, if we assume that the average velocity of the "cloud" was roughly 1/3 this amount, then a more accurate energy estimate is 1E38 joules (click here for the evidence behind this figure). It is often stated that the Death Star takes one full day to charge its main weapon for a planet-destroying blast, although this is actually over-conservative since the original Death Star destroyed Alderaan and was already charged and ready to destroy the rebel base on Yavin's moon later that day. Nevertheless, we can use the 1-day figure to determine that it must generate at least 1.2E33 watts on a steady-state basis to charge the weapon, plus whatever it needs to power the station's systems and propel the station through space. This amount of energy is enormously large- equivalent to 3 million times the power output of our sun! 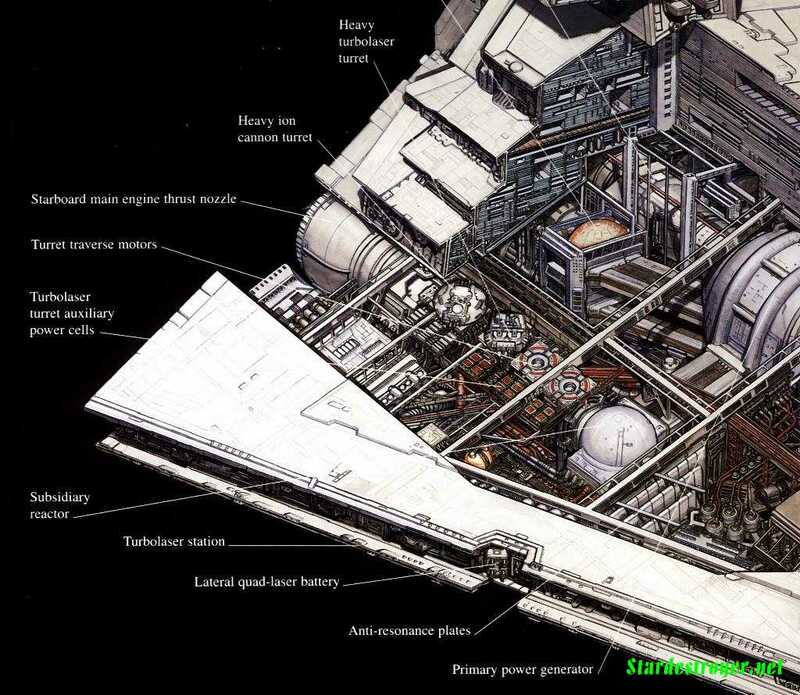 Neither nuclear fusion or matter/antimatter reaction would be sufficient to produce this much power, which is why the Death Star requires a hypermatter reactor, as mentioned in Star Wars Cross Sections. This hypermatter reactor is far more powerful than anything yet seen in the Federation, being capable of producing millions of times the energy of the Federation homeworld's sun. Some Federation cultists angrily dispute the enormous power estimates for the Death Star. Some of them claim that 1E38 joules is not required to raise the energy state of Alderaan by 1E38 joules (thus revealing their ignorance of the First Law of Thermodynamics), while others claim that the Death Star weapon may draw upon energy from another source such as the NDF harvested by phasers. However, this is simply not the case: according to SWICS, "the Death Star is built around a hypermatter reactor which can generate enough power to destroy an entire planet. "- this is an explicit statement indicating that the necessary energy comes entirely from the Death Star's hypermatter reactor core, not from the target matter or any other tertiary source. The Death Star's massive firepower reinforces the firepower estimates for other Imperial weapons, since they all derive from the same technological base (this is one of the primary reasons that Federation cultists have desperately attempted to dispute Death Star firepower estimates). Superlasers are not new technology; Mon Mothma described the original Death Star's superlaser as "the most powerful superlaser ever constructed" rather than "a new weapon known as a superlaser" (ref. Soldier for the Empire). This indicates that superlasers have been constructed before, but on a smaller scale. Brian Young, for producing the Turbolaser Commentaries and identifying many turbolaser characteristics. Mysterious hooded figure who identified himself as Jedi Anger, for pointing out terajoule figures from Isard's Revenge. Aaron Parsons, for pointing out text from BTM CD establishing that Death Star superlaser is based on turbolaser technology. Ethan Platten, for pointing out the gigaton quote from Slave Ship. Curtis Saxton, for general and Death Star-related discussion. John Miles, for input on the EGWT text regarding planetary turbolasers. Wayne Poe, Robert Wilson, Ted Collins, and others, for pointing out some bizarre Trekkie complaints regarding the BDZ figures. Kazuaki Shimazaki, for pointing out that I had erroneously based BDZ firepower estimates per cannon on 16 heavy turbolasers per ISD1, rather than 12 HTLs per ISD1 (the SWICS lists the rearmost turrets on both sides are heavy ion cannons rather than HTLs). All associated materials are used under "Fair Use" provisions of copyright law. All original content by Michael Wong is copyrighted © 1998,2004.